NEW: My latest tour addition is the Magic of the Highlands and Islands with two days in Lewis & Harris and two days in Skye & the Highlands. Experience Highland hospitality at its best with a local guide in each area. Scotland has hundreds of islands, but less than 100 are inhabited. There's something for everyone in the archaeology, legends, wildlife, castles and distilleries to be found on their shores. 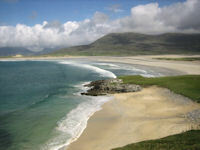 Off the west coast, islands such as Arran, Bute, Mull and Skye can be visited on a day trip from the mainland. While Orkney and Shetland lie off the far north-east tip of Scotland. Each island has its own unique character and culture. Here's just a selection. 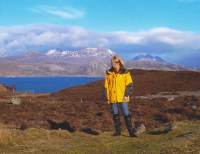 The second largest of the Inner Hebrides, Mull is a beautiful, unspoilt island with a coastline of over 300 miles. With hills, waterfalls, sea caves, standing stones, forest walks and beaches, there is plenty to explore. Just a short ferry ride from Oban, it is home to Duart Castle and Torosay Castle (both very different! 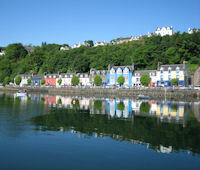 ), as well as the pretty town of Tobermory with its harbour and distillery. From Mull, you can easily take boat trips to the neighbouring islands of Iona, Staffa (home to Fingal's Cave) and the Treshnish Isles (famous for its puffins). 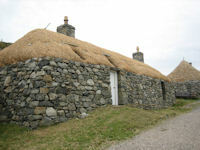 Iona is thought to be the first Christian site in Scotland. 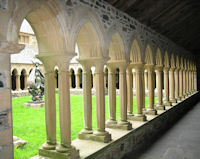 Now in the care of the National Trust for Scotland, Iona Abbey was founded by St Columba in AD 563 and is one of Scotland’s most sacred sites. The largest and most popular of the Inner Hebrides, the 'Misty Isle' is famous for its mountain scenery (the Cuillins and Quiraing), Fairy Pools, legends, castles and distilleries. It's easily accessible from the mainland via the Skye Bridge, or by ferries from Mallaig and Glenelg. Bastion Gaelic culture, the Outer Hebrides offer a diverse landscape featuring golden sandy beaches, rocky coastlines and hills. From Lewis and Harris, this island chain stretches down through the Uists and Benbecula to the tiny island of Barra (made famous by 'Whisky Galore'). Here in the Outer Hebrides (or Western Isles) the contrasting landscapes, wildlife and history, together with the legendary hospitality of its people provide a wonderful escape from the pressures of modern life. Stepping back in time, you can see the old blackhouses on Lewis and there are numerous standing stones throughout the Hebrides with the main circles being found at Callanish. In the summer months there are many colourful wild flowers to be seen on the machair. The famous Harris Tweed is made all over Harris and Lewis. It can be bought in many of the islands' shops and also direct from the weavers who you can see working on their looms at home. Genuine Harris Tweed is from wool spun, dyed, finished and woven in the Hebrides. Orkney is a group of islands situated a few miles off the north-east tip of mainland Scotland. With its green fields and hills, stone pinnacles rising out of the sea, rugged cliffs and sandy beaches, it is the ideal place for getting away from it all. Orkney is rich in ancient history dating from the Stone Age to the Picts and Vikings. Here you will find prehistoric villages, ancient tombs, ruined palaces and standing stones. 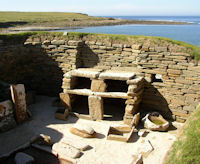 Orkney is recognised by UNESCO as a World Heritage Site. In addition to having so many sites of archaeological interest, the islands also have a very interesting wartime history. The islands all have varied histories and individual cultures. 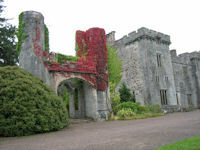 Wildlife abounds, while ancient churches, standing stones, castles and ruins can be visited.